At Weetacon, I and some of the other ladies once again had the opportunity to model clothes generously provided free for review purposes by IGIGI. 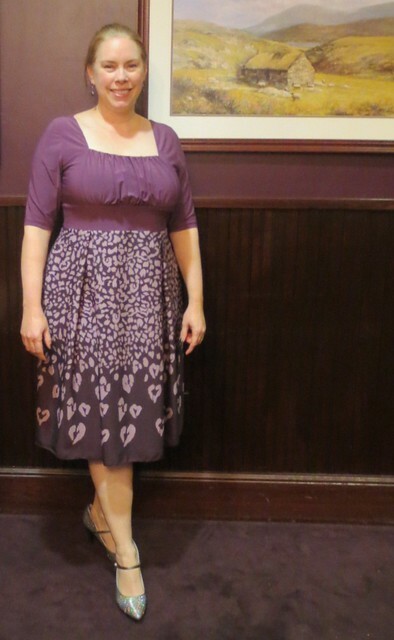 I got the Aubriella dress, which caught my eye on the site because it’s in my favorite color family of purple. The bodice and sleeves are a solid plum color and the skirt is a plum and lavender print with abstract hearts emerging from the pattern as the motifs head toward the hemline. I wore this out to dinner Saturday night of the con, accessorized with drop earrings and subtly sparkly pewter heels. If I’d brought a necklace that worked with the dress, I would have worn one, but I didn’t feel too exposed leaving my neckline bare. As I’ve come to expect from IGIGI, this was well made, including a full lining. I was excited to try it on when I first got it up to my hotel room; I pulled it over my head and was panicked when it seemed like it wasn’t going to fit—then I realized it has a side zipper. Well, yes, that does make a difference, and when on and zipped up, it fits nice and close but not too tight. It was very comfortable to wear and flowed over the parts of my body I don’t necessarily like to highlight. No crazy restrictive undergarments were required, either. The square neckline was something different than I usually wear. I liked the look of it, and it did cover my bra straps, which is always a good thing. The wide waistband on this hit just below my bustline; that’s not my usual preference because my natural waist several inches below that is the narrowest part of my torso and I like to show it off. Despite that, I did find this flattering to wear so perhaps I should reevaluate my avoidance of the Empire waist. I’m thinking I’ll wear this again when Mr. K and I go see Book of Mormon later this month. Heck, I like it so much I might even wear it to work and let people wonder what I’m up to that I’m not in my usual much more casual garb. UPDATE 03-April-2013: To share the IGIGI love, there’s a contest to win an Igigi gift certificate by commenting on this entry and those of the other ladies who participated in the Weetacon event. Their posts will be going up between now and April 15th, so keep checking back on the Weetacon IGIGI page linked below. How to participate in the IGIGI Weetacon Giveaway: Go to the IGIGI website and pick out your ideal dress for a special occasion, important business meeting, date night, or what have you. Then leave a comment on this review, telling us which garment YOU want and where you plan on wearing it. You can increase your chances of winning an IGIGI gift certificate by leaving comments on each of the other Weetacon IGIGI reviews at this page. Comments must be received by May 14 at midnight PST. 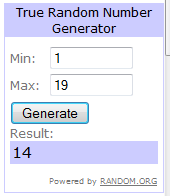 Winners will be notified and announced on this page and the IGIGI at Weetacon 2013 page by May 18th. Update 14-Jun-2013: The winners of the IGIGI contest have been announced! My winner is tona and she will be hearing from the Weetacon administration very soon. For a list of all of the winners please go to to the IGIGI at Weetacon page. 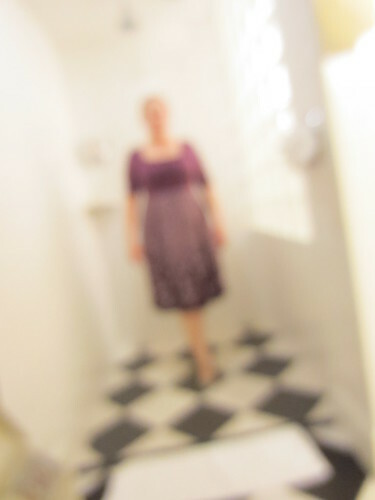 The dress in this entry was provided to me for review purposes by IGIGI. The content of this entry was not dictated by IGIGI; I get to keep the dress for my personal use. Links to the IGIGI site in this entry are affiliate links for Weetacon. I love the Vera dress. I would wear it to a fundraiser or a date night with my husband. I love many of the Igigi dresses, but I think I love the Chrissy maxi dress the most right now…love the color, love that it has sleeves. I would wear it out with the girls or the manpanion. How adorable is the Riley Dress?! I’d want to wear it on a picnic on a riverbank, after riding there on my bicycle with a straw basket. I’ll probably just wear it to work though. That dress is gorgeous, Karen! That colour looks great on you! I love the Doris 2-in-one dress – so cute and it would be perfect for work or play. You look great in that dress! For a dress, I’d choose the Callie dress to wear on a romantic night out with Joe. I might even wear it to work! However, I’m really lusting after the Ishiko top in raspberry rose. You look lovely in this dress. The rich colour and style suit. I would wear the Jacqueline 2in1 Dress in Jade. Great dress for either work or works-drinks. The Riley was my fave dress, but I’m reconsidering, this is fabulous. Great cut and color….so pretty on you! This really is so pretty and romantic. Good summer outing dress! That is a gorgeous purple color. My favorite dress for a night out is the Leigh Lace Dress in Black Iris. I think it’s gorgeous and would love to own it someday! What a pretty pattern and color. I would love to wear the Doris or Riley on my next girls night out. I love the style of the Aubriella and I think it looks just perfect on you. I like the deeper purple of the Francesca myself. I think it would be the perfect dress to wear to some of the summer movie blockbusters or for a lovely evening out with friends. Cute! I am really loving the Katie dress. I think it could work great for a night out, or even to work during the warmer months. I love this dress, it is my favorite so far. The print is simple, yet elegant, and the dress construction looks flawless, and comfortable! Love your choice of shoes also! You look beautiful, Karen! I love that dress on you. I want the stella so bad it is eating me alive. I’m really loving the Aubriella dress. I just found out about igigi and am reading all these reviews, really thinking about getting one. You so totally rock the plummy purples! Me, I’m a green girl, I would love to get a Tiffany in hunter green for wearing out everywhere! I love that outtake, and I love the color of the dress! The ruches/pleating on the bust of that dress is so pretty, and you wear it so well! The dress I want is the Versailles dress, to wear this June to a work conference where I have to be a little dressed up but want to be springy/summery, too!